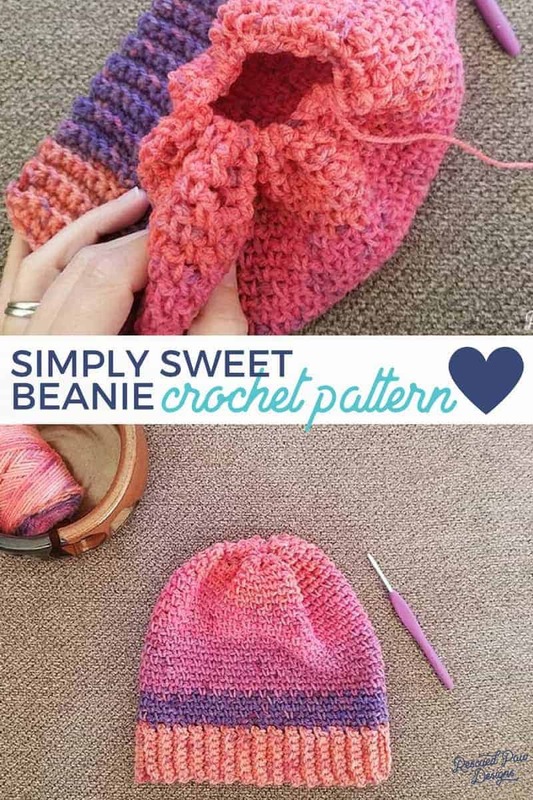 The Simply sweet crochet beanie hat is exactly what the name suggests! It’s simple, looks sweet and uses less than 1 skein of yarn! 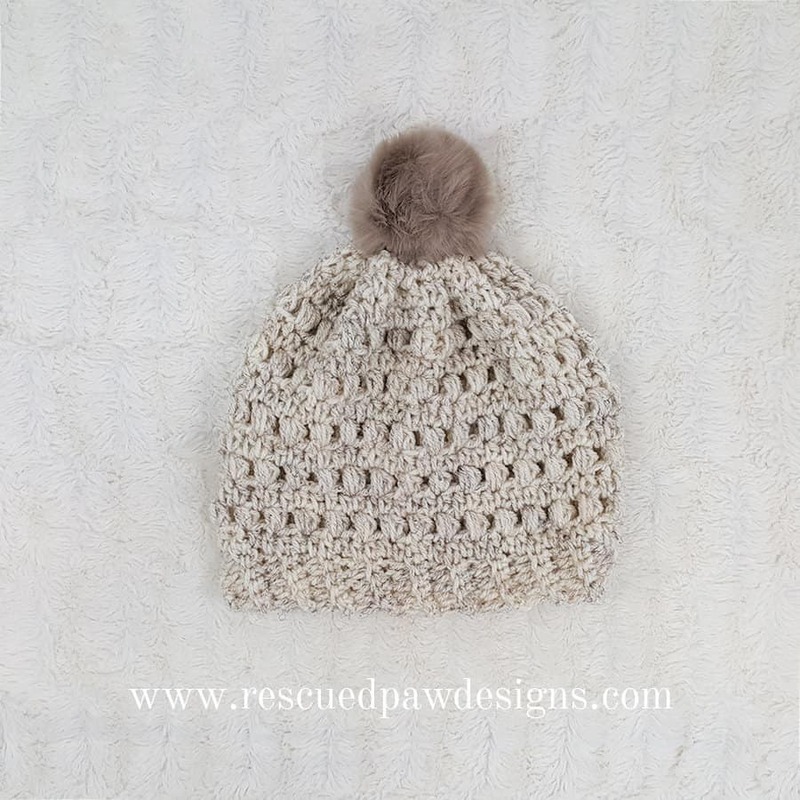 If you are looking for a quick crochet project then this simple beanie is for you! Last fall I was browsing my local craft store when I came across a Caron Cupcake from Yarnspirations. If you haven’t seen them they are yarn cakes wrapped to look like little cupcakse! They were to cute to pass up so I picked up the colorway Sweet Berries which is a fun mix of purple, pink and salmon. 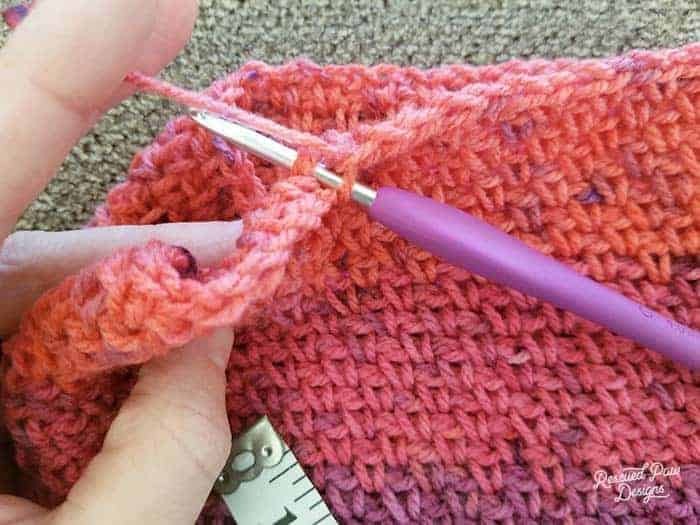 The label suggested a size G crochet hook while not extremely small it was definitely different than the 10 mm crochet hook I love to work with. 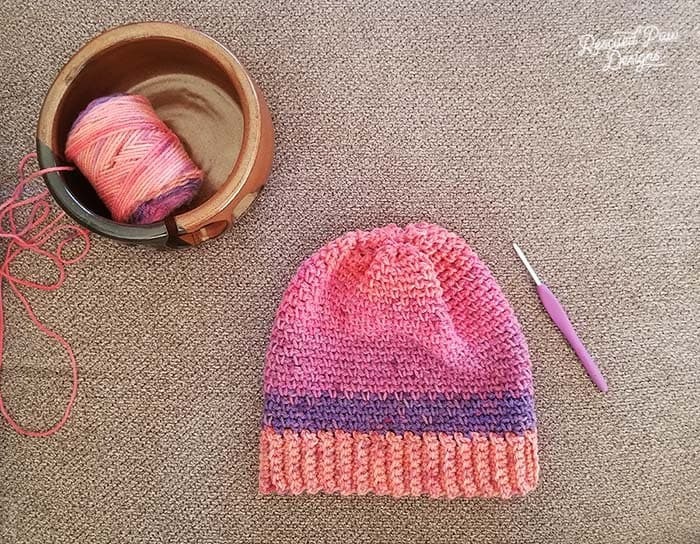 I was a little intimidated at first but loved how the small hook size gave the beanie a sweet delicate look. 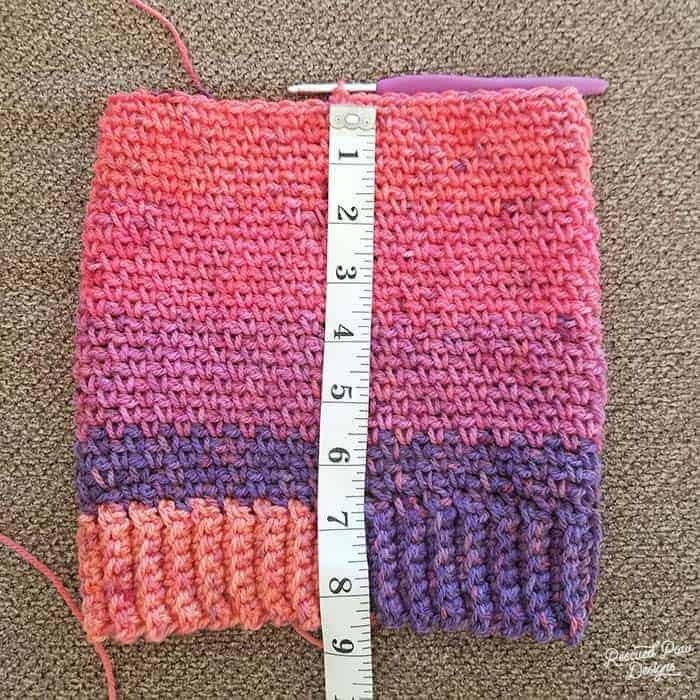 Please keep in mind if you do decide to use a different yarn the gauge and overall look of the hat will differ ever so slightly. Ready to get started? Scroll on down to find the free beanie pattern or “Click Here” to purchase an Ad-Free PDF version of this pattern! -Finished Size is approximately 9″ in length by a 20″ circumference (not stretched) as written. Adjust width by making band longer or shorter in an even #. 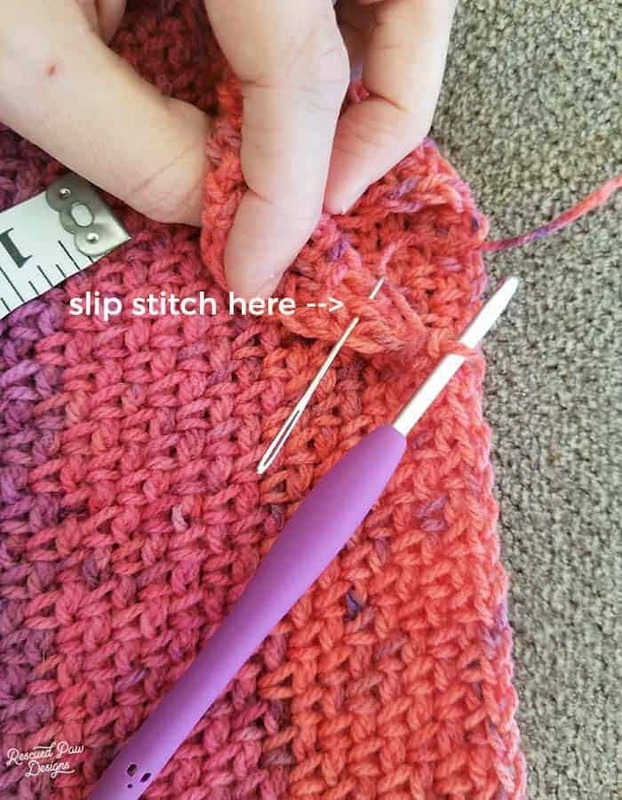 Finish the band by holding Row 1 and Row 68 together to join with a Sl St (slip stitch) do not fasten off! You will now be working along the long edge of the band we just joined. Chain 1, work a sc into the space between rows 1 & 2, Ch 1, work a sc in between rows 3 & 4, Ch 1, (see pictures for reference), Repeat across by sc between rows and Ch 1 until you have a total of 33 sc’s and 33 ch 1’s for a total of 66. Do not ch 1 or join, work a Sc in the first Ch 1 space of round 1, ch 1, work another Sc into the next Ch 1 space, repeat around until your hat measures approx 8.5 to 9″ from band to top. (whichever fits best) ending with a Sc. 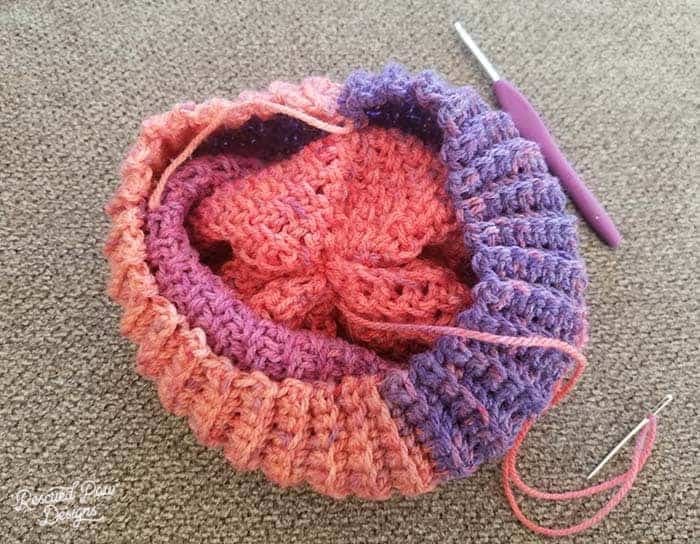 Fasten off yarn leaving a good 12-15″ yarn tail. Attach the tail of yarn to the sewing needle. Weave in and out through the last row of stitches. Pull tightly to close! 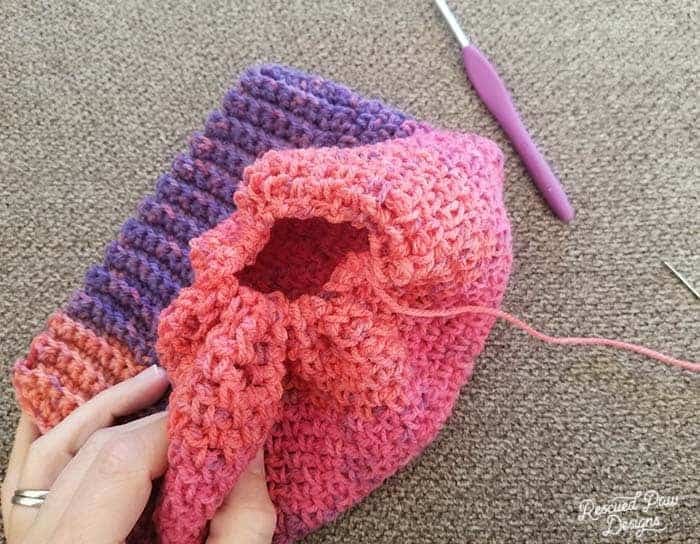 Turn hat inside out to fasten off and secure the loose yarn ends. I tend to use this technique a lot to finish hats like my Williams Beanie. It becomes quite easy after doing it over and over. 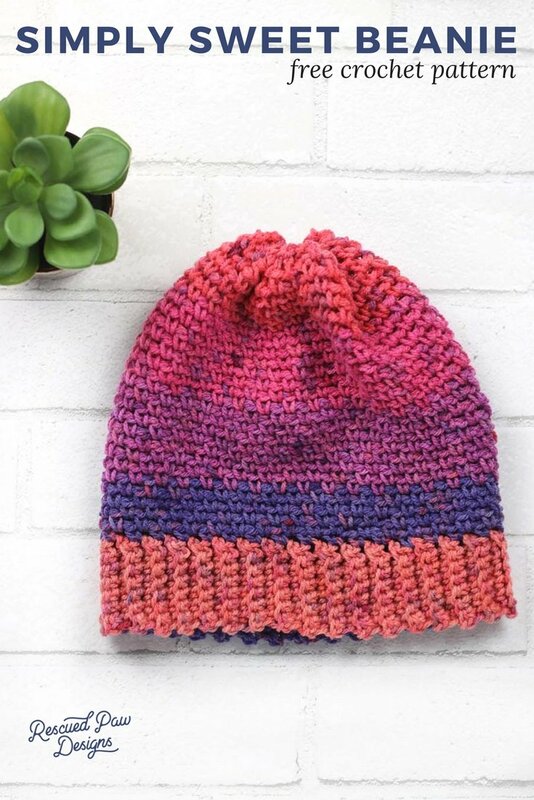 Now just finish up this easy crochet beanie by weaving in all yarn ends throughout the hat! That’s it! The sweet crochet beanie is now finished! You can add an optional pom or faux fur topper to your hat! If you’d like to do that you can use the Clover Pom Maker for an easy solution! I hope you enjoyed this design! 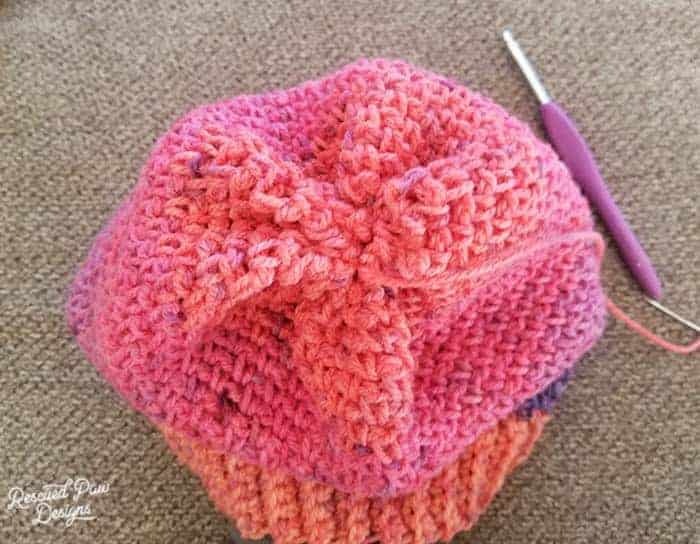 If you liked this easy beanie pattern follow along with me on Facebook, Instagram or Pinterest (where I pin daily!). If you prefer video tutorials you can also find me over on YouTube! This is sooo lovely. I intend to have a go when I get some yarn.